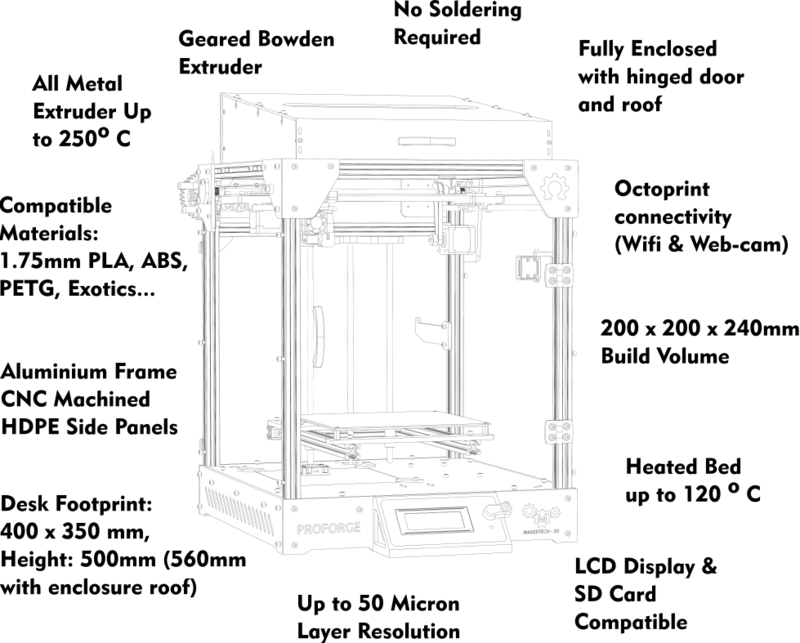 Introduction The PROFORGE is a thoughtfully designed, Large, Metal Frame OPEN-SOURCE 3D Printer Kit. It can be FULLY ENCLOSED and is set for OCTOPRINT (a wifi/web-cam control system that uses the raspberry pi). AUTO-LEVELING, an LCD SCREEN and a HEATED BED are STANDARD FEATURES. There is also a MAXIMUM OF 150 being made for this project, this is to ensure that people who do pledge receive their Printer in the described shipping time and that the project does not get “clogged” by over subscription. Proforge 3D Printer FEATURE SPECIFICATION Build Volume 200 X 200 X 240mm Aluminium Surface Heated Bed RepRap MK2 Heated PCB Bed – Up to 110˚ Celsius Extruder E3D V6 Clone – Up to 250˚ Celsius Printable Materials PLA, ABS, HIPS, PETG & Other exotics… Min. Layer Height 0.05mm Electronics RAMPS 1.4 / Arduino Combo Power 12v 360W Dedicated PSU Standard Features Heated Bed, Auto-levelling, LCD Screen, SD Card Support Upgradable Options Octoprint (+£60), Full Enclosure (+£75) OPENSOURCE AND HACKABLE The Proforge is a completely opensource and hackable machine from the ground up. It uses entirely off the shelf components. The only “specialized” parts are the cnc machined HDPE panels, .dxf drawings for which will be made available on our website along with all other source files once printers start shipping. The proforge also makes use of 3D printed parts making modifying and/or replacing parts super easy. All this is built around a 2020 aluminium extrusion frame held together with cast aluminium brackets. EXTRUDER The hotend is an E3D V6 Clone, an all metal hotend capable of delivering up to 250 degrees Celsius, making it super easy to print a wide range or materials from PLA to ABS and other exotics. Compatible filament diameter is 1.75mm. The extruder is mounted onto an “extruder mount” which mounts onto a “tool carriage”, this allows for an effortless swapping of tool heads (only undoing two screws). Also on the extruder mount is a 50mm blower fan with a snap fitting fan shroud that blows a cool stream of air onto the print and an inductive probe sensor for auto levelling. The extruder Feeder is both Powerful and Precise, it uses a NEMA 17 Motor and a 3:1 herringbone gear setup. This drives an MK8 feeder gear,. The Idler arm is tensioned with a simple spring mechanism (holding the nut and tightening the M5 screw increases the pressure on the filament). The filament is then pushed up through the PTFE tubing and into the hotend. EXTRUDER FEEDER AUTO BED LEVELLING The Proforge uses an inductive sensor to probe the bed at 9 points to create a curved surface mesh. The extruder then follows this curved surface for the perfect first layer. Z-AXIS The platform is a sheet of CNC machined HDPE with aluminium extrusions on the underneath for support. The Print Bed is a 220 x 220 mm, 1.5mm thick aluminium sheet on top of a PCB heated bed that sits on top of four brass 12mm stand offs, the print volume is 200x200x235mm. The platform rides on long format linear bearings and is driven by a T8 Lead screw coupled to a NEMA 17 Motor, the coupler is a spring type that clamps onto the shaft rather than using grub screws which shift and misalign the shaft only contributing to dreaded “z-wobble”. The kit also includes some PTFE grease for the lead screw. SMOOTH MOTION The Proforge has a H-style gantry powered by NEMA 17 motors; the x-motor carriage, Idler and tool carriage are 3d printed. The gantry rides on self lubricating bronze bushings and 8mm stainless steel rods. The Bushings slot into the 3d printed parts and are held down using cable ties. The Y-axis is also geared to provide greater resolution in the axis. The X-axis pulley is central through the tool carriage and the Y-axis pulleys attach onto the outer sides of the x motor carriage and Idler creating a balanced system. This configuration is smooth and incredibly effective not only for maintenance purposes but also a considerable amount quieter when printing as opposed to using ball linear bearings. Also linear ball bearings over time scratch into the rods leaving grooves, the bronze bushings instead ride on a thin layer of grease. The frame is made from 2020 aluminium extrusions held together by die cast aluminium corner brackets. Attached to the frame are CNC machined HDPE panels. HDPE is a a dense material with a very high tensile strength. Unlike acrylic it does not crack or shatter and is attached to the frame with a bolt, t-nut and spring washer. The HDPE panels create a housing at the bottom of the printer for the electronics and power supply. On the top corners of the machine these brackets hold up the motion system and extruder feeder. FRAME ELECTRONICS The Proforge is powered by a RAMPS 1.4/Arduino Mega combo, an incredibly common and reliable electronics solution for 3D printing. Motors are controlled with pololu a4988 micro-controller boards which result in 1/16 micro-stepping of the NEMA 17’s. The Proforge also uses the latest version of Marlin (RC-8 at time of writing), a very common and opensource firmware. The machine is powered by a dedicated 12v 360W Power supply. The electronics compartment also has space for a Raspberry Pi for running Octoprint. The Proforge also has an LCD screen and SD card reader making it easy to monitor the machine, preheat heaters and move motors. The SD card also lets you print directly of it and have the printer run with out it being connected to a computer. LCD SCREEN & SD CARD READER CLEAN & TIDY The Proforge uses braided cable sleeving for routing wires which gives the entire machine a sleek finish. USB and power ports are all mounted onto the back of the machine making everything easy and accessible. OCTOPRINT Octoprint lets you control and monitor your prints over your homes Wi-Fi network. Take full control of the Proforge, start and stop prints, preheat heaters and send .gcode commands. Octoprint also allows you to make awesome time-lapses of your prints too with the included on-board camera! ENCLOSURE The enclosure is made of laser cut 3mm clear Perspex panels that go around all four sided of the printer. The roof is held together using t slots and swings up and can rest vertical. The door also swings open 180 degrees. The enclosure is incredibly useful for printing ABS and other exotic materials where print quality is enhanced by having a warm printing chamber. The enclosure also improves quality by preventing unwanted drafts from blowing across the print that may cause it to warp and crack. 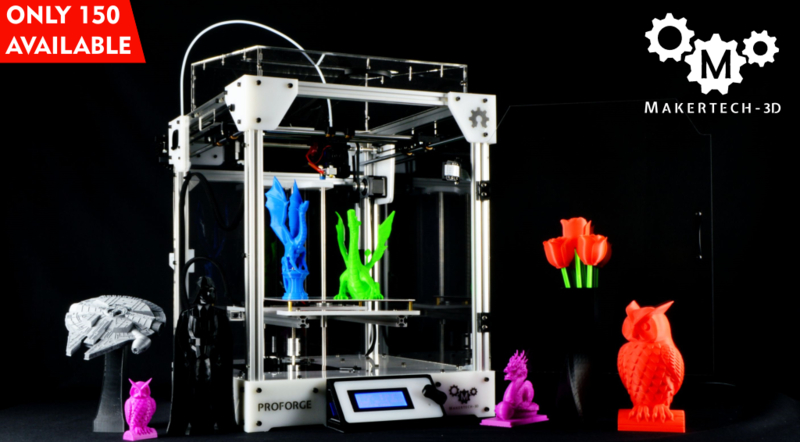 PROFORGE 3D PRINTER KIT – All parts to build the Proforge. – A small tool kit. – Kapton tape. – SD Card. – 10m sample roll of PLA. – Country dependent power cord. We are rather impressed by the design and the printer and would love to get one to test and review. We also do educational events and a dual extruder printer would be cool. Now that is pretty awesome! Be the first to comment on "Proforge 3d Printer-Kickstarter"